U.S. consumers replace TVs every 6.9 years on average. That’s a long time without an upgrade, especially during this technology-driven shift in how we watch TV. There will be more services, and there’s no good way to know if your TV will get them. Even if it does, how long will it keep getting the latest features? Third-party app support is up to the third parties. Imagine if the apps on your phone never updated. Soon, you might get a smart TV that stays smart through its lifespan, but that might still be one upgrade away. My two-year-old TV is great. I love it. Big fan. The 48-inch, 4K screen bathes me in its warm glow every time I sit down for another NFL Sunday marathon. Like so many other sets sold in the past few years, my TV is “smart.” It has an app store, and a full keyboard on one side of the remote for when I have to enter my password. It’s an appealing idea: I’d love to do everything with one remote. But the first thing I do every time I turn on my TV is switch to my Roku Ultra and pick up its remote—because my supposedly smart TV is already pretty dumb. My TV has a Hulu app, but it lacks the app’s newest features, like live TV and multiple profiles. It doesn’t have a Sling app, which I use for football since it offers the RedZone channel. It doesn’t let me browse with my voice through Google Assistant or Alexa, the way newer TVs can. It’s slow and clunky, and even the interface is low-res. So many of the features and services that are becoming integral parts of the TV experience have to come from some other device. Strangely enough, I’m still a believer in smart TVs. Next time I upgrade, I’ll get another one. But the way things work now, these expensive, huge devices age like cars depreciating as they drive off the lot. It doesn’t have to be like this. U.S. consumers replace TVs every 6.9 years on average, according to market-research firm NPD Group Inc. That’s a long time without an upgrade, especially during this massive, technology-driven shift in how we watch TV. A fast-growing segment of users is ditching cable and finding shows and movies through a library of streaming services. Some stick with Netflix and Hulu and Amazon Prime Video, but millions are opting for DirecTV Now or YouTube TV, diving into back catalogs through HBO Now and ESPN+, and cobbling together a library of free content with services like Sony Crackle and Pluto TV. There will be more services, and there’s no good way to know if your TV will get them. Yet even if it does, how long will it keep getting the latest features? 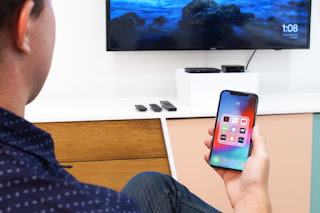 Samsung, maker of some of the most popular smart TVs, says it supports the overall TV software for the life of the device, but third-party app support is, well, up to the third parties. Other manufacturers are the same way. Samsung financing plans even incentivize you to buy a new TV every two years, just to keep up with the times. Imagine if the apps on your phone never updated, and you were stuck with whatever they could do the day you bought your phone. You can now buy a TV that practically melts into your wall and even looks like hanging art when it’s turned off, with a gorgeous screen that won’t look outdated for years. It’s ridiculous that I need to swap one great screen for another when the only thing broken is my Hulu app. To be clear, I’m not suggesting you buy the dumbest TV you can find, plug in a set-top box and call it a day. Smart TVs offer lots of useful features that have nothing to do with content. If you buy one of the new TCL 6-Series models, for instance, you’ll be able to access everything from your cable box to your Blu-ray player from a single remote and home screen—and the Roku is built in. (You don’t know happiness until you’ve stopped guessing which gadget is on which HDMI input.) Samsung and others also allow you to control everything from your phone and even listen to your TV through headphones. Some even let you control your TV with your voice via Google Assistant or Alexa. Your safest bet in choosing a smart TV is to pick one that’s already winning. As streaming services confront the swelling list of platforms where people watch stuff—from their phones to their tablets to their game consoles to their VR headsets—it’s only logical they’ll start with the popular ones. That’s why they’re likely to end up with Roku and Amazon Fire TV, platforms built into more TV sets now, in addition to streaming boxes. “We have a lot of partners that really like that we provide them a single experience, a single app that gets delivered to all our products,” said Sandeep Gupta, Amazon vice president of product development for Fire TV. Roku and Fire TV alone account for more than 60% of U.S. streaming-media users, according to research firm Parks Associates. Add in Apple TV and Google’s Chromecast, which many services support through mobile apps, and you’ve covered the vast majority of the streaming public. Why would developers add to their workload by also updating their apps on the growing assortment of older TVs? They wouldn’t. Take YouTube TV. You can’t access it on any Samsung or LG model from before 2016. YouTube says it’s working on expanding to more devices. Even Netflix, which supports more devices than any other service I can find, leaves some features out on older TVs. Roku and Amazon have proven they can simultaneously offer new features and support old devices. Both have most or all the content you’ll want to watch. I prefer Roku’s interface and larger content libraries, but the Fire TV comes with the Alexa voice assistant and some of Amazon’s neat movie-buff features like X-Ray, which shows trivia and information related to whatever you’re watching.The TV world seems destined to end up like the mobile one, with a few software companies powering the entire hardware universe. Fewer platforms means more support for those platforms, which means more and better apps for viewers. And while smartphone leaders Google and Apple both offer TV interfaces, they aren’t winning this time. Maybe Apple needs to invent a true iTV. Soon enough, you might get a smart TV that stays smart through its entire lifespan—but that might still be one upgrade away. Next time you go screen shopping, make sure you get both the best colors and the best software. Oh, and pro tip: Get the bigger one.